SYDNEY, May 25 2014 (IPS) - Still a long way off in many parts of the world, climate displacement is already a reality in the Pacific Islands, where rising seas are contaminating fresh water and agricultural land, and rendering some coastal areas uninhabitable. In Fiji, where the survival of 676 communities is now precarious, the government is set to establish the region’s first national policy to address the challenges of internal migration as the last option in adaptation. Home to over 870,000 people in the central South Pacific Ocean, the 300 volcanic islands that comprise this nation include low-lying atolls, and are highly susceptibility to cyclones, floods and earthquakes. Thus Fiji is no stranger to the devastation wrought by climate change, and its national policies hold valuable lessons for all governments bracing for climate-induced population movements. During its recent chairmanship of the Group of 77 nations plus China (G77), Fiji brought the plight of Small Island Developing States to the international arena, highlighting the disproportionate nature of the climate crisis. The Pacific Islands, for instance, are responsible for only 0.006 percent of global greenhouse gas emissions, yet they are experiencing its worst impacts. According to the Pacific Climate Change Science Program, the sea level near Fiji rose by six millimetres per year over the past decade, double the global average. During this century, ocean acidification, temperatures and the intensity of rainfall are also predicted to increase. When adaptation measures, such as building seawalls and planting mangroves, no longer stem the tide, survival depends on moving the affected population to new land and safer ground. The London School of Economics estimates that across the Pacific Islands, home to 10 million people, up to 1.7 million could be displaced due to climate change by 2050. The guidelines for internal population movements will become an addendum to the national climate change policy, introduced in 2012. They will be aligned with the broader policy’s principles of community ownership, involvement and consent, equitable benefits for all, including disadvantaged social groups, and the mainstreaming of climate change issues into national planning and budgeting. The new “relocation procedure is to be followed in all cases when communities seek the assistance of the government,” Kumar clarified. The preference of many Pacific Islanders is to relocate within their own country. More than 80 percent of land in Fiji is under customary ownership and has been for generations. Land is the main source of livelihoods, food, social security and ancestral identity for clans and extended families. Melanesian society places great importance on community self-reliance with solutions to local challenges historically driven by traditional leaders. This has determined people’s survival for generations and is one reason why, today, many refute the term ‘climate refugee’. But that doesn’t diminish the socioeconomic repercussions of, or financial resources needed, for physically moving large numbers of people, housing and infrastructure. Now in its final draft, the climate policy was first informed by the move and reconstruction of the Vunidogoloa village on Vanua Levu, one of Fiji’s two main islands, back in January. Living by the edge of Natewa Bay, as the people of Vunidogoloa had for generations, became untenable when the encroaching sea breached seawall barriers, daily flooding homes, while saltwater degraded the soil and destroyed crops like taro and sweet potato. While villagers had watched the gradual encroachment of the sea over a period of years, the ultimate loss of their traditional ancestral land and homes, they say, was distressing. The move, which took a total of three years, began in 2010, before the relocation policy was conceived last year. However, since then the experiences of both the government and local residents have been incorporated. “We are happy in our new village,” Suluwegi, a villager from Vunidogoloa, told IPS. “The houses are good and we are able to grow new crops for food.” The ministry of agriculture provided the new community with pineapple plants and technical support to promote new farming livelihoods. 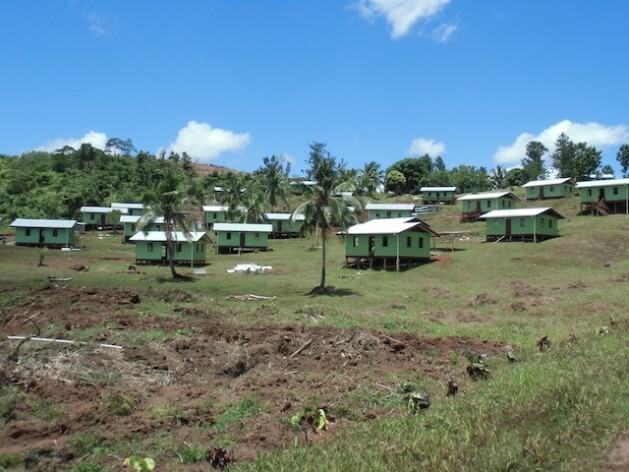 The ministry of rural and maritime development and national disaster management led the multi-sector process of moving 150 people and building 30 new houses, with each costing approximately 5,400 dollars. Suluwegi said that villagers actively participated in the decision about where the new settlement would be situated. Plans for relocation only went ahead after the community had given consent. Fortunately, customary land owned by the community was available about two kilometres away on higher ground, which was quickly identified as the preferred new site. “There were no land issues or disputes, which made our work much easier,” George Dregaso of the national disaster management office told IPS, hinting that the acquisition of additional customary land could have involved long, complex negotiations and substantial compensation to host landowners. Various ministries and authorities responsible for local government, agriculture, water, fisheries, forests and labour contributed funding and resources for the provision of basic services and new livelihoods. New water tanks and a solar power system were installed in the community. Villagers received assistance in re-establishing agriculture, including plants, breeding livestock and farming materials, as well as new ponds for fish farming as an income-generating initiative. Government funds covered 75 percent of costs associated with the relocation of Vunidogoloa, which totalled close to 535,000 dollars (about 978,000 Fijian dollars). The remainder represented the value of the timber that the community contributed to the project. While the villagers of Vunidogoloa were fortunate enough to find refuge close to their old home, others who are impacted by climate change might not be so lucky. Globally there is a critical lack of policies and laws to address the plight of climate migrants, either within states or across national borders. For instance, people internationally displaced due to climate extremes are not recognised under the 1951 United Nations Refugee Convention. But last year international lawyers, climate change experts and U.N. representatives devised the Peninsula Principles on climate displacement within states as an initial guiding framework for policy and lawmakers, based on current international law. Many of those principles, such as community participation and consent, provision of affordable housing, land solutions, basic services and economic opportunities to those affected, have been observed in Vunidogoloa. Kumar emphasised, however, that formal discussions about the legislative implications of Fiji’s relocation policy are yet to occur. Fiji’s current climate change policy is supported by existing laws and a new constitution established last year, which recognises that all Fijians, irrespective of ethnicity or status, have equal rights to housing, public services, health and economic participation. However, all Pacific Island states face challenges in fully implementing government policies due to limited technical, human resource and financial capacities. According to Kumar, further work on solutions to issues of land availability and sustainable funding ahead of future relocation projects will be needed as the policy draft enters its final stages. The learning process for all concerned continues, with the government still to undertake post-relocation monitoring and evaluation at Vunidogoloa in order to address any long term or unforeseen impacts.